One of Two Digital Billboard Faces On MTA Bus Lot at 16th & San Pedro Sts. 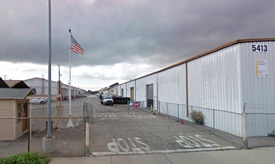 During last year’s debate on establishing a sign district to allow Clear Channel to put up digital billboards on an MTA bus lot next to a downtown freeway, much attention was given to fact that the sign district approval was tied to the sale of an MTA maintenance yard in South Los Angeles that the city wanted to buy and develop into a wetlands park. Councilwoman Jan Perry, who led the charge to approve the sign district, repeatedly accused those opposed to the freeway billboards of trying to kill a park project intended to provide badly-needed recreational facilities in an area afflicted by gang violence and poverty. Less attention was paid to the fact that in return for putting up the digital billboards on the bus lot, Clear Channel had agreed to drop a $15 million lawsuit brought against the MTA six years earlier over the removal of billboards from MTA property on the city’s westside. In fact, the MTA board had approved the lawsuit settlement nearly two years before the sign district/park proposal came before the City Council in the spring of 2008, but the exact terms of the agreement weren’t made public until after the council had unanimously approved the sign district, and only then in response to a formal public records act request. What business did the City Council have voting on an important issue involving an agreement to settle a lawsuit without even knowing its terms? For example, how much would the MTA be getting from these billboards directly facing motorists on one of the most heavily-traveled sections of freeway in the city? How much would the city get? How long would the billboards be there? These questions were raised by some opponents of the sign district, but were drowned out by Councilwoman Perry’s depictions of those persons as westside elitists who obviously couldn’t empathize with her less fortunate constituents who desperately needed neighborhood park and recreational facilities. So what does the agreement approved by the MTA board but kept secret until after the city approved the sign district actually say? For starters, Clear Channel’s lease with the MTA for the billboards runs for 50 years, renewable by the MTA on a month-to-month basis after that. Clear Channel is required to pay $100,000 annually to the MTA for the first five years of the lease, and $200,000 after that. Upon signing the agreement, Clear Channel also was required to make a one-time payment of $1 million to the MTA. Despite numerous assertions by members of the public and some media outlets that the billboards were paying for the South L.A. wetlands park, the agreement doesn’t provide a cent of revenue for the city. In fact, the park now under construction is being financed entirely by clean water bonds and other public funds, and the only reason it was tied to the sign district and freeway billboards was that the MTA refused to sell the park property unless the city approved the sign district. In certain other areas of society, that kind of thing might be called extortion, or at least holding a public amenity hostage for a selfish aim. But none of the city councilmembers who voted for the sign district questioned the MTA’s actions and motives. Leaving aside the question of whether or not 76 ft. high, brilliantly-lighted digital billboards within 100 ft. of a busy freeway are appropriate, what of the financial details? 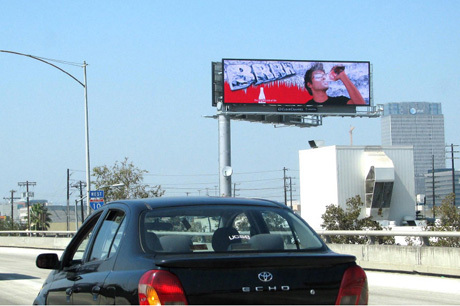 Taking Clear Channel’s own published rates, getting an 8-second spot on the two digital faces viewed by east and westbound motorists costs $17,500 for a 4-week period. According to Clear Channel’s promotional materials, there are eight advertisements rotating through a 24-hour period, which translates to total annual revenue of $1.8 million for those two digital billboards. Is $100,000 or even $200,000 a reasonable fee to pay for the right to collect nearly $2 million in revenue from billboards on public property? Given that the agreement runs for 50 years, what is that $200,000 going to look like in 2058? What’s it going to look like even ten or fifteen years from now, as a percentage of the revenue collected by Clear Channel? And then there’s the fact that the sign district did not just allow the two digital billboards, but two conventional billboards of the same size and height on the freeway just 600 ft. away. In addition to the digital sign revenue, Clear Channel will be getting significant income from those as well. Earlier this year, the City Council approved an agreement with AEG, the owner of Staples Center and L.A. Live, to allow billboards on the face of the convention center adjacent to the 10 freeway less than a mile from the MTA lot. That agreement calls for AEG to pay the city an initial fee of $2 million annually, plus a percentage of revenue. Even at that, Councilman Bill Rosendahl called it very bad deal for the city. If you conclude that the MTA/Clear Channel agreement looks like a giveaway to this multi-billion dollar international media company, you certainly won’t be alone.